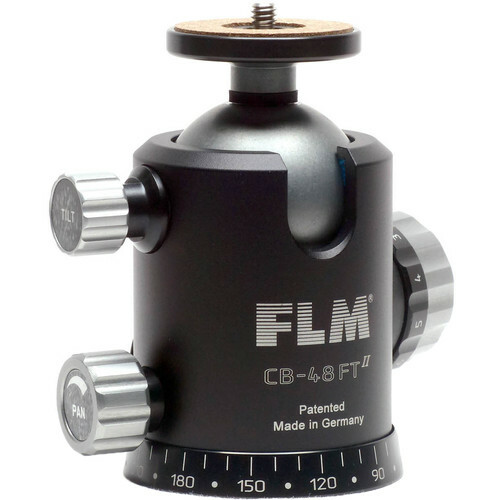 The CB-48FT from FLM is a high capacity ball head within FLM's Professional FT line. Featuring an impressive strength-to-weight ratio, the head can support a maximum load of 99 lb while maintaining a fairly light weight of only 1.3 lb. The head stands 3.8" tall and features a base diameter of just 2.5". It utilizes a 3/8"-16 bottom thread for attaching to most tripod legs and features a standard 1/4"-20 top thread for mounting most cameras and lenses. The FT line is designed around three important features which, when combined, make this ball head a unique and versatile tool. The first two are simple, an integrated knob for independent friction control and a separate pan lock with 10° markings for precise, incremental movement. The third feature is a patented 2-way tilt function which allows the user to lock the ball in a single position and then shift the ball back-and-forth along a single, straight line. This feature allows the head to be positioned in any direction and then separately leveled to straighten the horizon or bring a camera incrementally closer to a static object. Box Dimensions (LxWxH) 5.2 x 4.5 x 2.6"
CB-48FT Professional FT-Series Ball Head is rated 5.0 out of 5 by 2. Rated 5 out of 5 by Marc from WOULD LIKE TO GIVE 6 STAR RATING I choose the FLM to replace a Benro Ball head. Fitted with a Kirk quick release plate, this is the ideal configuration for me. Steady as a rock, holds my gear easy (Canon 5D Mk3 with battery grip). Like the tilt function a lot. First postion the pan position and you can easily make all correction in the tilt axis, and lock it up, ready. If you use this ball head for one week you will ask yourself how this is possible for this price. Top quality for a good (even cheap in my opinion if compared with competitors ) price. Rated 5 out of 5 by Peter from Thoughtfully designed, smooth yet robust tripod head This is the third FLM product I have bought from B&H, and all three are really well designed and finished. This FLM CB-48FT has replaced a BH-55 in my support kit. Its smooth as silk, the tilt function works really well, and the ball lockdown knob doesnt move your setting like many other tripod heads do. Also the friction memory lock (the black numbered ring in the picture) maintains friction settings while you lock and unlock the ball. There has been talk in the forums about FLM heads needing too many turns to lock. With these heads you dont have to turn the main locking knob until it wont turn any more, it locks the ball about 2/3 of the way in. I think FLM are sticking with fine threaded locking shafts which is a usability plus; you never have to worry about something coming loose like with the coarse threaded heads on a lot of ballheads nowadays. The round circular plate screwed into the ball stem spins off and you can invert the screw and put your choice of Arca-Swiss type clamp onto the stem. This is a high quality tripod head at a very reasonable price and it comes with a 10 year warranty on materials and workmanship. FLM is a small company that clearly has pride in its well-deserved reputation. Can the tension/friction be adjusted when using the 2-way tilt function in the F-series tripod heads and is it also possible to locked the ball movement completely when using the the 2-way tilt function. If so, with which knob? The tilt knob or the friction control knob? Yes, the tension is adjusted using the friction control knob. If you locked the ball movement you will only be able to pan.